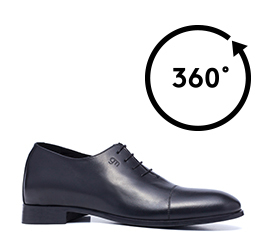 Elegant elevator wholecut shoe in full-grain black calfskin. A model obtained through a complex craft where the upper is shaped from a single piece of leather with no stitching. The outsole is in real leather. A shoe with inner elevator system able to increase height by 2.4 inches, fine and naturally shiny with a refined design which makes it perfect as an evening shoe.